It is currently week two of San Diego Restaurant week. During week one, we had dinner at Ruth’s Chris Steakhouse in Del Mar and were served an amazing creamed spinach casserole as a side dish, and I thought this would be a great new way to prepare spinach – something different from the spinach sauteed with garlic and olive oil that I normally do. 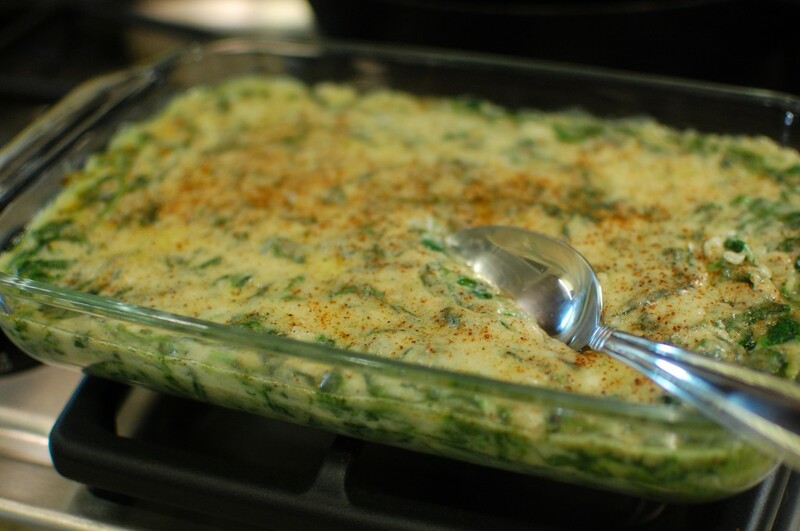 I found a few recipes online for Ruth’s Chris Creamed Spinach – however, I felt that there were a few strange ingredients listed (like cloves?) and not enough other seasonings to give a good flavor. I’ve had the dish at Ruth’s Chris… and looking at the bland ingredients… it just didn’t seem right. (I’m sure the actual recipe is secret, so there must be a few things they are leaving out). I tweaked the recipe a bit and added Parmesan cheese and nutmeg to increase the flavor. I also prefer to use unsalted butter – it’s much easier to add salt if needed than potentially start with too much salt. As it stands, this parmesan creamed spinach makes a wonderful accompaniment to a prime rib roast or steak dinner. The best part about this dish is that it can be prepared ahead of time and reheated just before serving – which makes it a perfect choice for dinner parties or holiday dinners. Enjoy! 1. 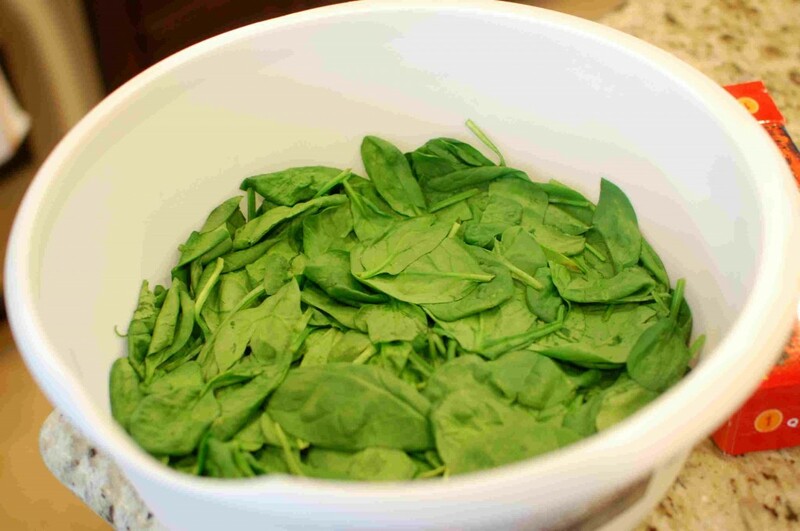 Microwave the spinach in a large bowl for 4-5 minutes. 2. Allow to cool, squeeze out the water, and roughly chop. 3. In a large saute pan (or use a wok, like I did here… hee hee! ), melt the butter. 4. Add the chopped shallot, bay leaf, salt, and nutmeg. 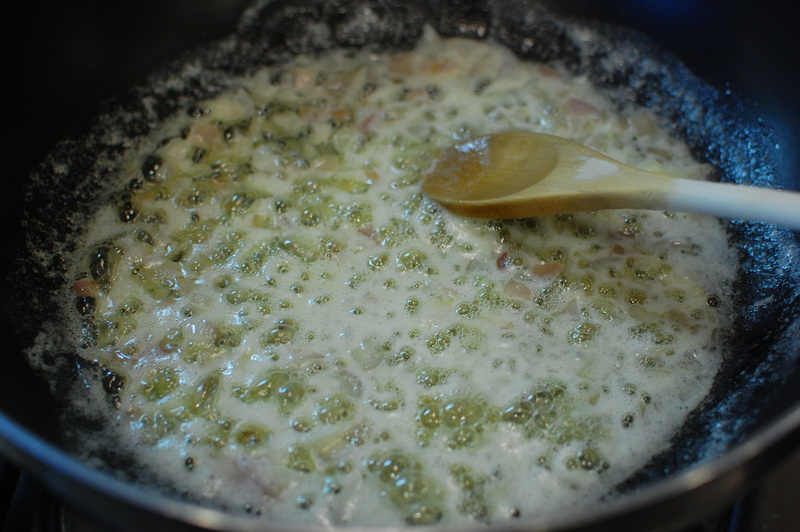 Saute the shallot over medium heat for about 2 minutes (when the shallot becomes translucent). 5. 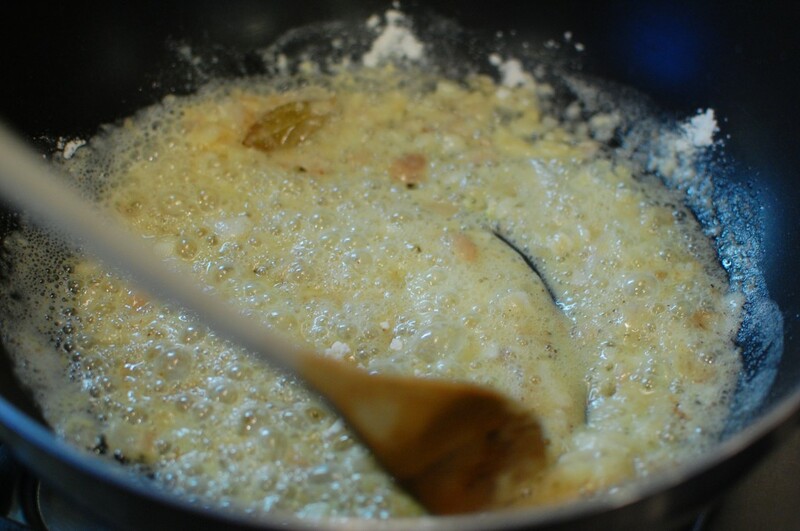 Stir in the flour to create a roux, and cook for about 1 minute until the mixture is uniform with no lumps. 6. 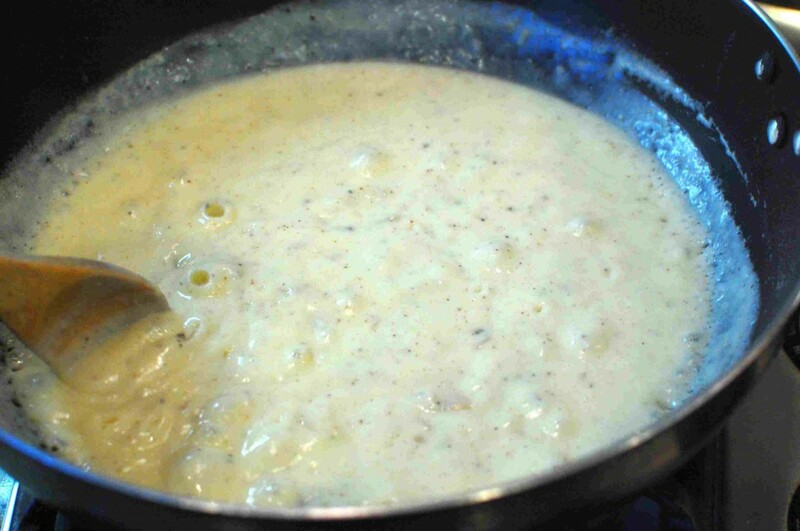 Slowly add the milk, while stirring to incorporate the roux. 7. 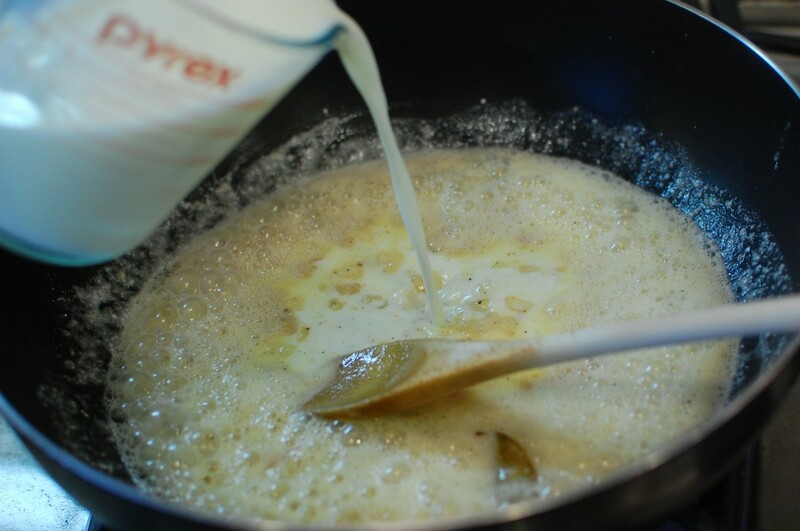 Cook and stir the milk mixture to a gentle boil and the mixture thickens. 9. Stir in the chopped spinach, and mix together until combined well. 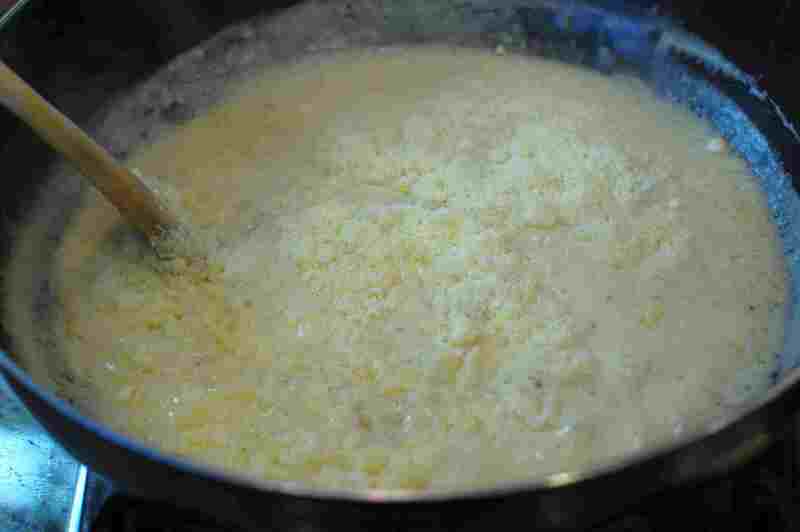 Pour the mixture into a large casserole dish, and top with the remaining 1/4 c. Parmesan cheese, and a sprinkle of extra nutmeg (optional). Taste and add salt and pepper if needed. 10. You can store this in the refrigerator (covered) for up to a day in advance at this point. Otherwise, you can bake immediately. 11. To heat, bring the casserole to room temperature first, then bake in a 350 degree oven for 20-30 minutes until hot and bubbly. If you plan to bake this immediately (instead of refrigerating overnight), then it will be done after 10-15 minutes in the oven. This. Was. Amazing. Served it for my husband, my mother, MIL, and FIL, with Prime rib and twice baked potatoes for Christmas dinner today, 12/25/2014. Followed the recipe to a tee. Made it the day before, let reach room temperature-ish before baking 25 minutes at 350. 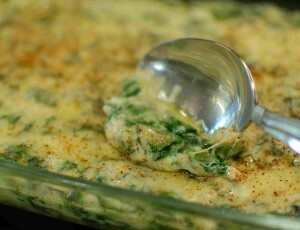 The prime rib was cooked perfectly, and still- everyone raved about this creamed spinach! My 17 month old even ate a good bit of it! Hubby and I have had it at Ruth’s Chris, and we both thought it was a dead ringer. I tried the other recipe online for Christmas dinner last year (the one that calls for cloves) and it was “okay” but THIS, this recipe is a keeper!! Thank you so much for posting! Yay! Glad I could help! Hope you and your family had a wonderful Christmas! 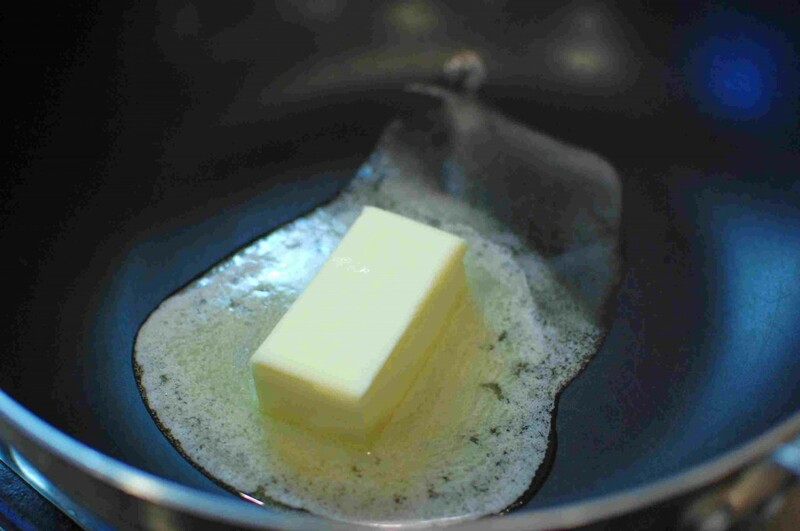 In your recipe, you state 1/2 cup butter, but in the picture you used what looks like 1/2 stick of butter. I followed the recipe and used 1/2 cup (which is 1 whole stick) and it was too much, i had to double the flour and milk. The recipe says 1/2 cup, which is 1 stick… and that’s what is shown in the photo. You can adjust the amount of butter if you think it is too much, but I think it turns out better if you use the entire stick. But feel free to adjust according to your likes/dislikes. It may a Costco stick of butter, which are a bit shorter and thicker than grocery store models. IDK, but I can’t wait to try! I love Ruth’s Chris creamed spinach. But I think I love yours more. I’ve been looking for awhile for something as good (or better) than theirs. I didn’t have any shallots, so I used a sweet onion and garlic and topped it with some seasoned bread crumbs in addition to the Parmesan. I made this tonight and had my 14 yr old son try a bite. He snatched the fork out of my hands and started shoveling it in from the pan. I had to guide him away so that we would have some left for supper. Thanks for a great recipe. Yay! I’m so glad you (and your 14 year old son) liked it! The garlic and bread crumbs!! Perfect additions to this already very good recipe. How many serving do you think this does? Our dinner is for 20 and I have problem making 2 if needed. Probably about 4-5 side dish servings. If you are having many other side dishes available, then people probably don’t need a full serving, and you could get away with just doubling the recipe. If this is a main side dish, you may want to triple or quadruple. This is a true keeper! Just made it for the second time and couldn’t be more pleased with end result. Added artichoke hearts for more volume; the best sauce I’ve ever made! Thank you! Glad to hear it! Thanks for your comment. Artichoke sounds like a wonderful idea… have to try it next time. Hello I will be making this tonight and I can not wait. I just have one question. When you microwave the spinach do you add water? Sorry for the late reply. No, you do not need to add water. Way too much sauce for only one pound of spinach. You show a large dish in your photo and one pound of spinach only fills a small casserole dish. Should the recipe call for more spinach? And the “small casserole dish” you are referring to in my pictures is actually a 9″ X 12″ pyrex dish. Wonderimg if you can use frozen spinach? If yes how many bags? Can u use heavy cream instead of milk?Also do you just sprinkle rest of parm cheese b 4 going in oven? Thx so much! I’m sure you can… check the oz or lb. measurement on the bag and substitute equal amounts. Just make sure you defrost and drain out the excess moisture first. 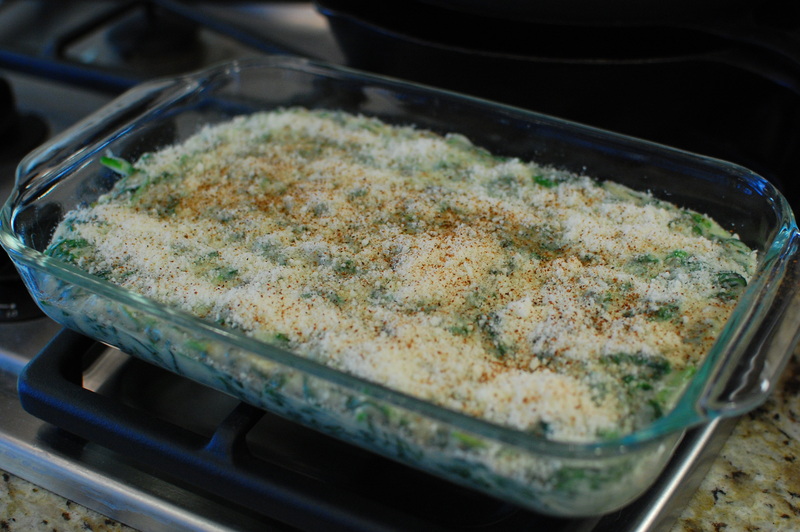 And yes, sprinkle the remaining 1/4 c. parmesan over the top before baking. 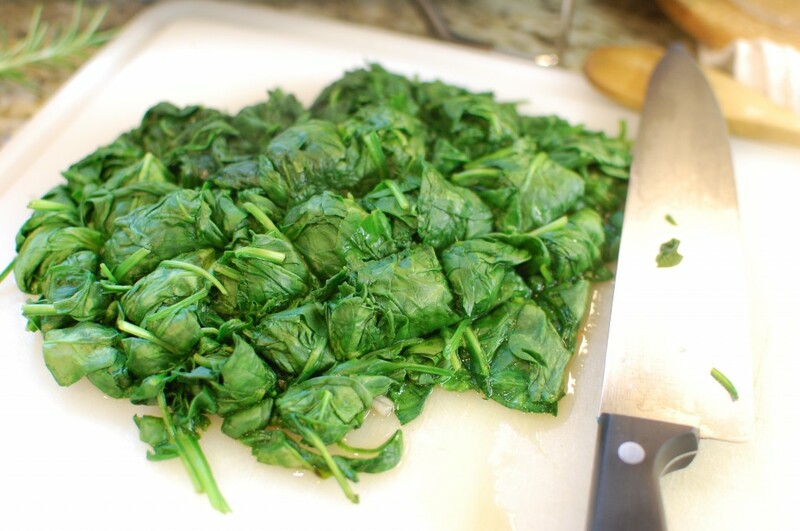 No need to add water… there is plenty of water inside the spinach leaves! Probably about 4-6 people as a side dish. Made a quadruple batch of this to go with a prime rib Christmas dinner for 16 and it was amazing. Everyone loved it. So glad you liked it! Hope you and your family had a wonderful Christmas! I made this last night with the exception that I used almond milk in place of regular milk and no one knew the difference. It was DELICIOUS and I will definitely be making it again! First time I have tried creamed spinach and loved it. Wouldn’t change a thing about your recipe. Thanks for sharing. My family and I loved this recipe. Thank you for sharing this delicious recipe. Silly question…can this be served sans baking? Yes, I think you could stop at step 9 if you wanted to. I like the extra browning from baking though. I just made this for tonite and the sauce is soooo good. 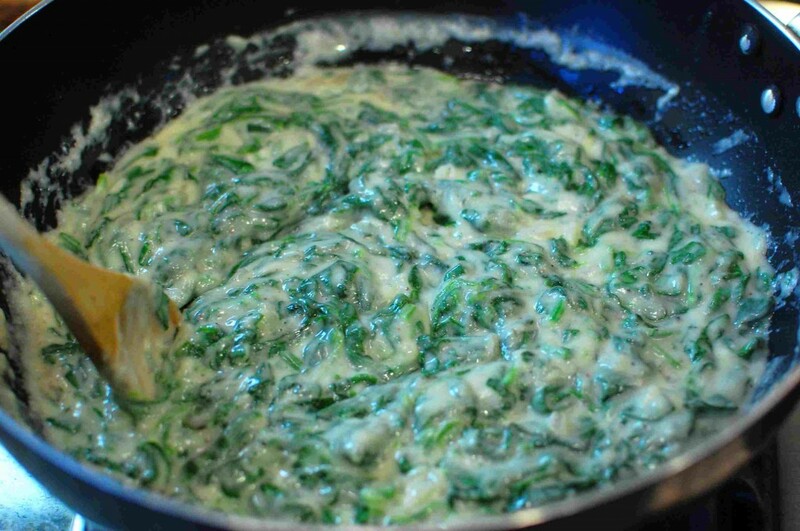 I don’t know what others are talking about, but it’s not too buttery and it is plenty of spinach for the sauce…can’t wait to cook later tonite! I made the spinach tonight with only one small change (used half the amount of salt) and it was delicious! I served it with fried chicken. It is definitely a keeper. Love this recipe!! Everyone wanted more spinach instead of dessert!! OMG….I have made this recipe 4 time within the last month! I love that it’s simple but oh soooo delicious. Thank you for sharing and helping me discover a new side dish to add to my collection. I made this for Easter dinner. I left out the nutmeg because I didn’t have any. It was still delicious. Everyone loved it. I also left out the teaspoon of salt the parmesan has more than enough ot it and I did not bake it. EXCELLENT!! My husband and I LOVED this spinach. Looking forward to making it for the holidays! Thank you! Made this and fell in love. It’s so simple to make but so good. Adding this to the book! I just made this and used it to stuff portabella mushroom caps…..delish! I partially cooked the caps on the grill( gill side down) then finished them stuffed on indirect heat for approximately 15 minutes, followed on direct heat for approximately 10 minutes ( they were BIG caps) . Wow yum – great idea! 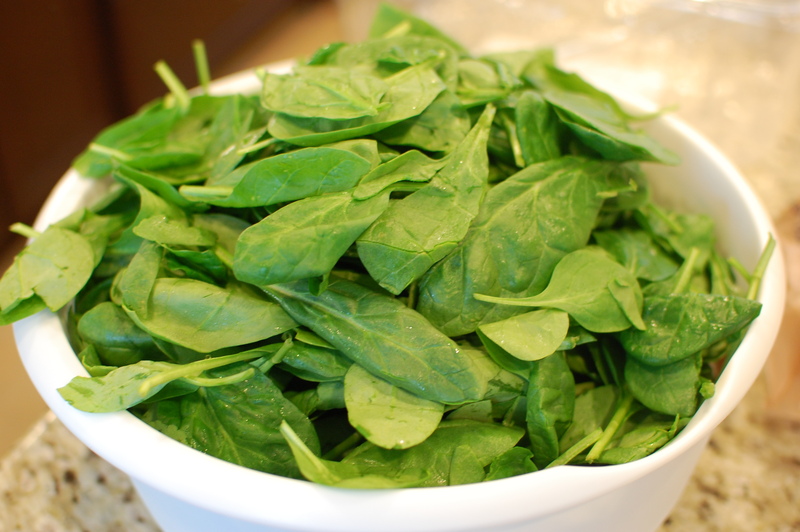 If there is spinach in Heaven, this is the recipe! YUMMERS! !